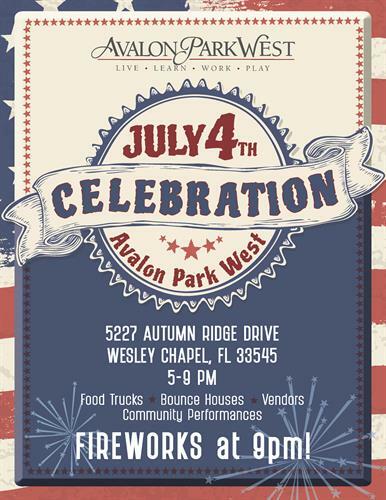 Avalon Park West will be hosting a free Independence Day Celebration, on the 4th of July from 5 p.m. to 9p.m. They will be having a firework show in Wesley Chapel, which will begin at 9 p.m. The free for the public celebration will encompass family friendly activities such as an Apple Pie Bake-Off, Bike Parade, wet and dry slides, stilt walkers, vendors and food trucks. APW is currently looking for vendors who are interested in promoting their business in front of about 5k event attendees. For more information please contact MFernandez@AvalonParkWest.com. This live, learn, work and play hometown will be having an event families and friends do not want to miss.